How do you view sickness? 1/The medical model is, eat drink, be merry, and do your own thing. Never cleanse or detox, and when you get sick or diseased just go and get the drugs to alleviate those symptoms -and perhaps even an operation to cut out offending organ or tumour if necessary. Two common mistakes people make, is viewing the tumour as the problem in itself, but the truth is –removing/ shrinking the tumours do not cure cancer! And the second is not associating food, hydration and lifestyle, to our modern illnesses. Following this model, most people see disease as mysterious, like it can just fall from the sky and you never know just who will be next. The truth is if you live this way- and do nothing, you’ll certainly get something! 2/ The Nutritional / Self healing model always questions “Why did this something happen in the first place”. the symptoms or the pain the body is displaying, is not the problem, it is simply indicative of an underlying cause. 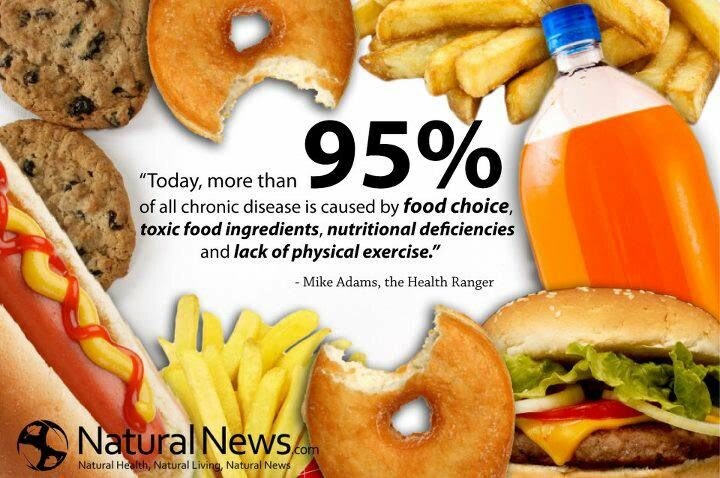 Stop putting the toxins in, address the deficiencies, and the body wants to heal itself! An Alternative to Medicine - Not Alternative Medicine"
What we are seeing in society today, in the skyrocketing of sickness & disease, is in short -‘Multiple chronic deficiencies”. The real problem I believe, around the whole disease issue, is that most people don’t have access to resources of trusted information. We have been taught and programmed that the food pyramid is fact, but many are starting to see this is how we got ourselves in such a state of affairs in the first place, and have discovered the whole truth about the food, that is seen as daily essentials- such as milk and bread, to be nothing more than glorified junk food. I know I’m in danger of treading on toes here, but the truth is, a lot of folk don’t want to give up, what could give them great health in return! Don’t believe everything you’ve been fed! Do the research for yourself. People all over the globe are reversing the irreversible, by adopting a plant based diet and moving away from modern convenient foods. If changing what you eat could keep you from getting cancer, wouldn’t you do it? You don’t have to be afraid of the big C word anymore. This kind of fear comes from uncertainty, lack of control and lack of information.